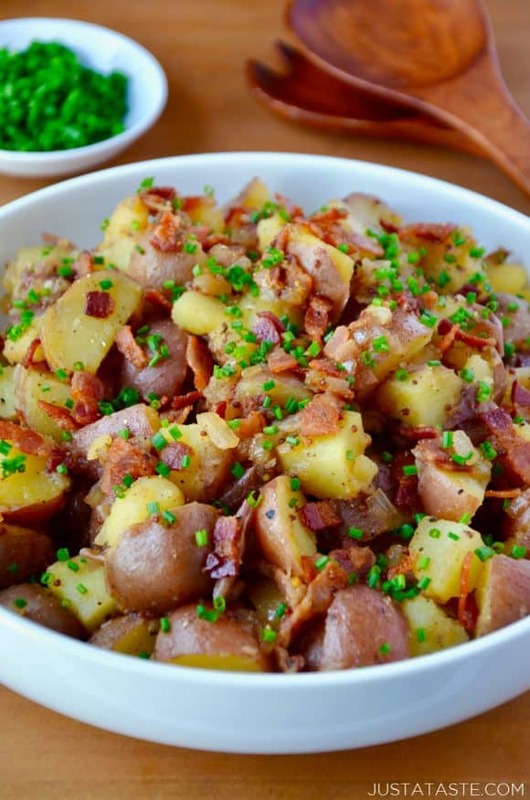 Skip the cold side dishes and wow the crowds with this fast and fresh recipe for Potato Salad with Warm Bacon Dressing. Step aside, all you chilly, starchy side dishes. It’s no longer cool to be … cool. Because there’s a new recipe in town and it is h-o-t hot. As in, Potato Salad with Warm Bacon Dressing HOT. So here we are in all our warm bacon dressing glory. It’s certainly savory, but that’s not all. It gets a little tang courtesy of some whole grain mustard and a bit-o-bite via a solid splash of apple cider vinegar. Cook it all together with sweet yellow onions and we’ve got a flavor trifecta that will knock your socks, shoes and speedos off. 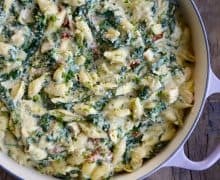 So whether you’re in need of a summertime potluck dish that will leave guests begging for the recipe, or you’re simply tired of potatoes covered in two types of cheese and butter (Does this actually happen to people? ), allow me to introduce you to your new starchy, super-hot BFF. 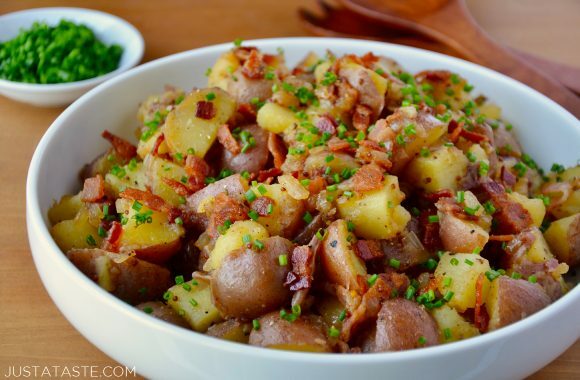 Take it away, Potato Salad with Warm Bacon Dressing! Boil the potatoes in a large pot of water until they are fork-tender, about 15 minutes. Drain the potatoes then allow them to cool completely. Cut the potatoes into quarters then add them to a large bowl. Add the bacon to a large sauté pan set over medium heat. Cook the bacon until it is crispy and all of the fat has rendered off. 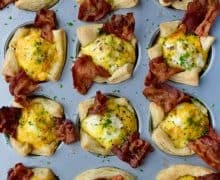 Using a slotted spoon, transfer the bacon to a plate, leaving 3 tablespoons of the drippings in the pan. Add the diced onions to the pan and cook, stirring, until the onions are translucent. 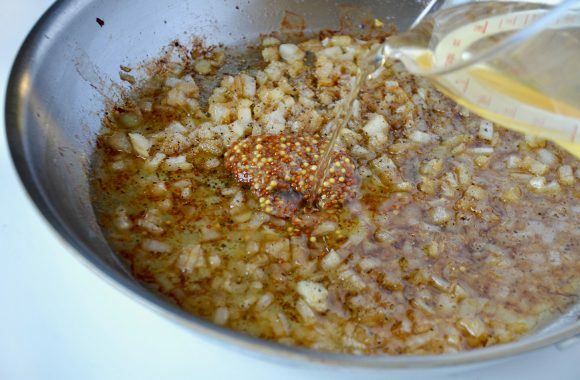 Stir in the apple cider vinegar, whole grain mustard, sugar, 1 teaspoon salt, 1/2 teaspoon pepper and 1/2 cup water. Simmer the mixture for 3 minutes until it has reduced to 1 cup. 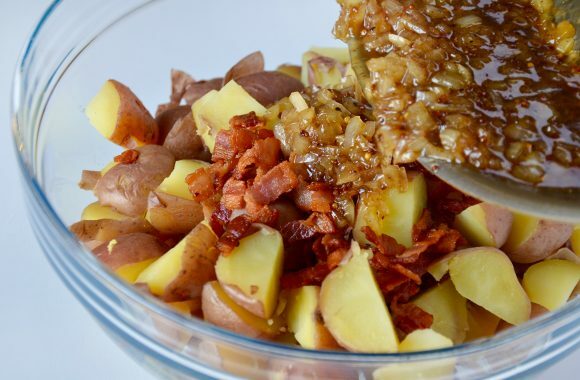 Pour the dressing over the potatoes, add the cooked bacon and toss to combine. Stir in the chives and serve warm.